Betti Wiggins has worked in school nutrition for 25 years and has been with the Detroit Public School Nutrition Director since 2008. While the number of children in the district is just over a third the size it once was, 55,000 students still rely on the school lunch program for breakfast, lunch, and snacks. “What excites me is the ability to repurpose some land on behalf of the community—and the community does include our children—and to be able to increase access to fresh fruits and vegetables,” Wiggins says. In 2009, nearly 80 percent of students in the district qualified for the federally funded free lunch program. In 2011, the city expanded that number to include the entire student body through the US Department of Agriculture’s Community Eligibility Option Program. At the same time, the USDA began encouraging schools to incorporate more local produce into their menus, grown either by area farmers or by students in school gardens. In 2009, the school system started sourcing local asparagus, acorn squash, Michigan apples, and other local crops. 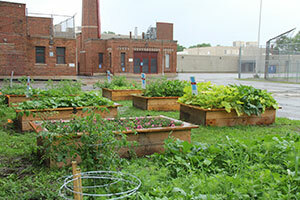 The following year, the district established school gardens in 23 schools throughout the city. This year, the number of participating schools has risen to 75. Students and teachers plant yellow squash, green zucchini, and red tomatoes in raised beds for a red, yellow, and green “stop light salad” that is served in the school cafeteria. Teachers can select additional crops, such as collards or herbs. Participating schools also agree to integrate a garden curriculum into their science classes as a supplement to existing STEM education programs. This year, Wiggins is spearheading a major project that plans to blow up the school garden model into an urban farm that will feed the entire district, while giving new life to an abandoned school. The Kettering Urban Agricultural Campus is housed on the former site of Kettering High School, which was closed in 2012. Kettering was one of the state’s lowest performing schools and the student body had fallen to half of the building’s capacity. Kettering’s 27-acre campus provides ample room to experiment with different crops. The first step will be to convert former ball fields into cropland. In one field, the group may just plant rye to remediate the land, Wiggins says. “Remember, it was just a ball field, so you’ve got to grow something to put some nitrogen in there,” she says. Part-time and seasonal workers will install 4 hoop houses on the old football field that could be used to grow biannual crops like asparagus and garlic. The second year will be a major test in terms of learning just how much food can be produced on the land. By the third year, she and district officials will focus on the physical building of the high school. For now, it remains unclear if the building will be renovated or simply torn down, Wiggins says. She expects to have a good sense of whether or not the project can be sustained with child nutrition funds and grants within five years. Economic viability is extremely important right now, she says. “We’re right now working with a conventional farmer because it has to be sustainable, because we just can’t keep putting money into it,” she says. There’s a lot more at stake than just an agricultural venture, says Wiggins. The city is in desperate need of revitalization now. If viable, this project could prove that something vibrant and fresh can thrive within an area consumed by blight. “Everybody from every kind of age group has a high interest in seeing this program succeed,” says Wiggins.